Do you know where every drop of rain that falls on your roof goes? Well, if you don't have a well-designed gutter system, the water might end up on the walls or the foundation of your home. We are sure that a bad gutter system will show itself in time, either in your basement or with brown spots and bubbling paint on your walls. You may already have these problems but do not recognize that a poor gutter system may have caused them. 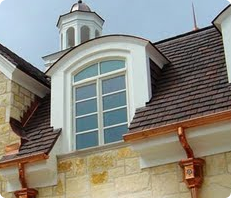 Our seamless gutter systems will fit the overall appearance of your home. Seamless gutters are manufactured on site with our special manufacturing gear. We offer our gutters in an extensive selection of colors. We can find you the color that is an exact or a fairly accurate match with your existing siding, trim, soffit and fascia. These seamless gutters will not only protect your home and property, but they will strengthen the general aesthetics of your residence. Our professional crew can install your seamless gutter system in no longer than a day. We at Mr. Fix It use only heavy-duty gutter hangers with 3-inch screws and premium product aluminum coils. The hangers are hidden so you will not see old spikes or nail heads. These extra strength hangers lock the gutter on both sides; the front and rear assuring that our gutters will never hang down from the weight of ice or snow. A cover or leaf guard system is important for capturing the water and not the debris such as leaves and twigs. We can also install an optional leaf guard system as part of your gutter installation. Just ask for more information. We'd be happy to answer all of your questions. Quality and dependable service is our promise.